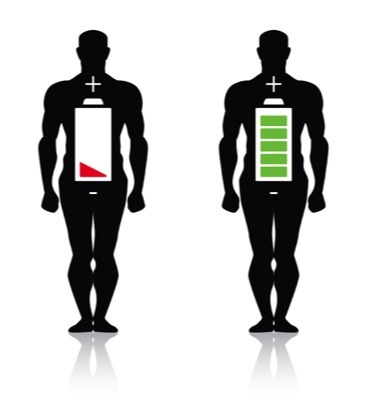 Low Energy – is your battery running on or near empty? I often see patients who come in feeling tired and low in energy. It really helps to do a full set of holistic blood tests to see what is going on with the body organs and systems. Poor or interrupted sleep due to young children waking up or changes in hormones especially around the 40’s to menopause or difficulty with breathing issues at night due to self or a partner snoring and keeping the person awake or the effects of wine, caffeine and stress on the sleep cycle. Poor adrenal function with chronic stress and poor sleep cycle. Often gets off to sleep okay and then wakes in the early hours wired. We can check all the adrenal hormones and see if low then work out herbs or nutrients or natural hormonal approaches to improve energy. Changes in ovulation can mean that the body no longer produces as much progesterone in women. Progesterone is our calming hormone that helps sleep so pre-menstrually and in the menopause the sleep cycle can be interrupted creating fatigue. Men can be low in testosterone or adrenal hormones and thus feel tired too. Thyroid issues with auto-immune Hashimotos inflammation of the thyroid due to gluten or viral or other immune challenges upsetting the thyroid gland tissue and leading to low thyroid function and fatigue is something I commonly see in my clinic. Blood sugar changes with high insulin, low Vitamin D, low protein and consequent weight loss resistance. It is hard to lose weight and the diet changes don’t drop your weight. Often some Vitamin D in good doses along with complementary vitamins and minerals are needed to restore balance. Once you are sleeping and have more energy exercise also helps restore the blood sugar balance. Work is excellent for morale and enjoying activity with purpose is great, but sometimes our work or home environment becomes stressful due to various ongoing situations and this can lead to tiredness. Food intolerances and allergies are really common with everything we get exposed to in processed food today. It is often important to assess your metabolic or genetic tendency to go better with certain food types – some foods act like toxins while other foods heal the gut. I have a strong interest in this area and work in with other nutritionists to help a person balance their food types to achieve health and energy. Sometimes we need to take out certain foods like gluten or dairy to improve health and energy. Chronic infections, pains or allergies in the body or immune reactions to viruses like glandular fever can create fatigue so we look to see if there are any specific signs of these or other diseases in the body including dental or teeth problems. If you are low in iron, Vitamin B12, folic acid or other nutrients like magnesium you will feel tired so it is important to check these on blood tests and improve with whole foods or supplements as needed. Liver & other organs like the kidneys are also key to energy and can be assessed as part of a thorough set of diagnostic blood tests. Often the first visit we review your history and present problems with energy, health, the body and see what is going on; then work out what tests to do. The next visit I go over these results with the person and we sort out a plan for treatment of the main problems that have been found. I look forward to working with you all to help assess and improve energy so we all have more energy for the areas of life we enjoy!